It’s easy to tell when someone may be suffering from a heart attack, is choking, or is unable to breathe. But what does depression look like? What about anxiety? Have you met a youth experiencing suicidal thoughts or behaviors? Do you know how to administer first aid in a mental health crisis? 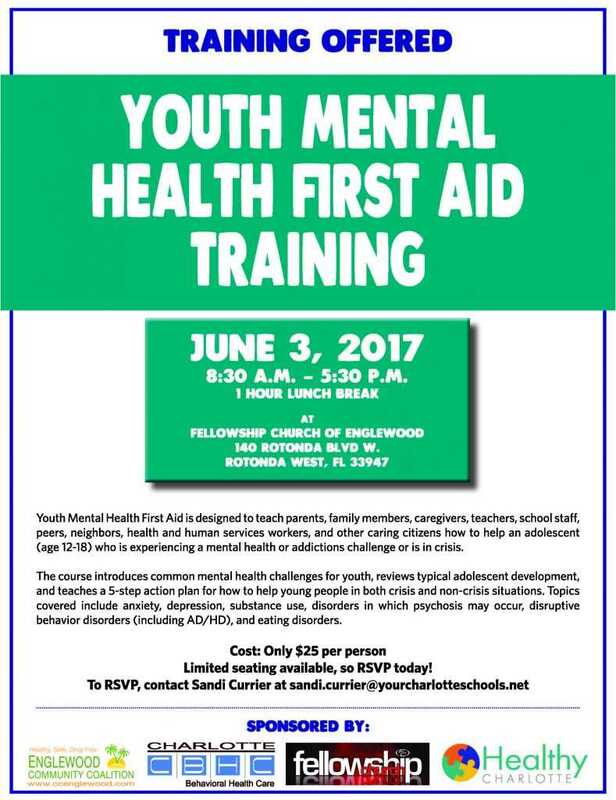 On June 3rd, from 8:30 a.m. – 5:30 p.m., a Youth Mental Health First Aid Training will be held at Fellowship Church of Englewood, located at 140 Rotonda Boulevard West in Rotonda West. The cost is $25 per person. Limited scholarships may be available for those unable to afford the $25 fee. The training is sponsored by Englewood Community Coalition, Charlotte Behavioral Health Care, Fellowship Church of Englewood, and Healthy Charlotte. What is Youth Mental Health First Aid? Youth Mental Health First Aid is designed to teach parents, family members, caregivers, teachers, school staff, peers, neighbors, health and human services workers, and other caring citizens how to help an adolescent (age 12-18) who is experiencing a mental health or addictions challenge or is in crisis. “This course gives people the training and tools they need to start a dialogue with youths experiencing a mental health or addiction challenge or crisis – and ultimately save lives.” says Kelly Pomerville, Marketing & PR Manager at Charlotte Behavioral Health Care. For more information or to RSVP for the event, contact Sandi Currier at sandi.currier@yourcharlotteschools.net. Limited seating is available, so call today!